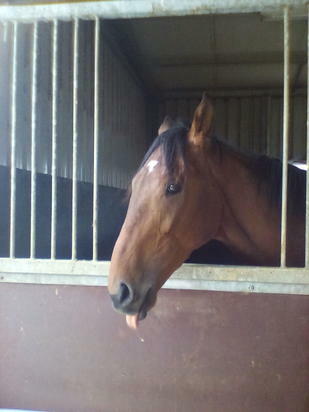 ALL TOO HARD (AUS) (Bay 2009-Stud 2013). 7 wins-3 at 2-from 1100m to 1600m, ATC All Aged S., Gr.1, MRC Caulfield Guineas, Gr.1. Half-brother to SW Black Caviar. Sire of SW Curdled (Qld Tatt's RC Winning Edge S., L), SP All Too Huiying, Mystic Empire and of Eclair Sunshine, The Mighty Fed, Aberro, Superhard, All Too Royal, Hard Faith, Sasso Corbaro, Too Easy Bro, All Come True, All Too Sweet, Allied Power, Castleton, Hard Ruler, Lakota, etc. His oldest progeny are 3YOs. Dirasara (g. by Dansili). 2 wins at 1600m, 2100m in Aust. Locket (f. by Fastnet Rock). Winner at 1300m in Aust. Soaring Wyvern (g. by Exceed and Excel). Placed in 2016-17, 2d HKJC Panasonic 4K IDTV H.
Raweesha (f. by Redoute's Choice). Placed at 3 in Aust. CRITICISM (Machiavellian). 9 wins from 1800m to 2400m, €132,570, US$632,060, Belmont Sheepshead Bay S., Gr.2, Calder La Prevoyante H., Gr.2, Aqueduct Long Island H., Gr.3-twice, Gulfstream Park The Very One S., Gr.3, La Coupe de Marseille, L, Prix de l'Agglomeration de la Region de Compiegne, Maisons-Laffitte Prix de Longueil, 2d Belmont Flower Bowl S., Gr.1, New York S., Gr.2, Athenia H., Gr.3, Grand Prix de Marseille, L, Bordeaux Prix Occitanie, L, Saint-Cloud Prix Dushka, 3d Gulfstream Park Orchid S., Gr.3, Lyon-Parilly Prix Andre Baboin, L, Longchamp Prix de Viroflay. Producer. BEAUTY PARLOR (Elusive Quality). 4 wins-1 at 2-from 1600m to 2400m, €79,900, US$101,280, Gulfstream Park Orchid S., Gr.3, Bordeaux Prix Occitanie, L, 2d Toulouse Prix Caravelle, L, Saint-Cloud Prix Polly Girl, 3d Deauville Prix du Perche, 4th Vichy Prix Madame Jean Couturie, L.
THE BROTHERS WAR (War Front). 3 wins-2 at 2-at 1100m, 1200m, €86,600, US$37,823, Chantilly Prix Sigy, L, Prix des Usages, Deauville Prix de Tancarville, 2d Longchamp Prix des Melezes, 3d Chantilly Prix Montenica, L, Longchamp Criterium de Vitesse, L, Saratoga Quick Call S., L.
ROSTROPOVICH (Sadler's Wells). 7 wins from 1½m to 3m, £113,438, €33,995, 60,000fr., Leopardstown Saval Beg S., L, Curragh Sallins H., 2d Aintree Martell H. Hurdle, Gowran Park Galmoy Hurdle, 3d Longchamp Prix Hubert de Chaudenay, Gr.2, Leopardstown Ballyroan S., L, Down Royal Juvenile Hurdle, Leopardstown Christmas Hurdle, Spring Juvenile Hurdle, Punchestown Champion Stayers' Hurdle, Wetherby West Yorkshire Hurdle, Leopardstown Towers S., 4th Irish St Leger, Gr.1. SILVER BEAUTY (Aussie Rules). 5 wins from 1400m to 2400m in India, Calcutta One Thousand Guineas, L, Calcutta Oaks, L, 2d Calcutta Derby, L, 3d Mumbai Indian Oaks, L.